Fall is a wonderful time to getaway to our luxury Boutique Hotel on Bainbridge Island. Though we’re only about 5 miles as the crow flies (or as the boat travels) from downtown Seattle, Bainbridge Island feels like its miles away from the city, offering a much needed respite for the busy soul. We are an island known for iconic Northwestern beauty, its rustic rural character, and quaint but hip downtown. Bainbridge Island is also home to world-class attractions liked the famed Bloedel Reserve and the newly built Bainbridge Island Museum of Art (BIMA). We most certainly lived a charmed life on Bainbridge, which is what makes this such a perfect getaway destination. Book a room at our boutique hotel on Bainbridge Island, and come see for yourself the beauty of our little island. The Northwest isn’t particularly famous for fall foliage, but there are a few places to go when you want to see those famous autumnal hues. There is one place on Bainbridge that seems to be an exception every fall, and that is Bloedel Reserve. Bloedel Reserve, a 150-acre classic Northwest Woodlands garden, is a wonderful place to go when you need a moment to yourself, or when you want a deep breath of fresh Northwest air. 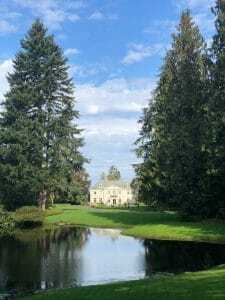 The New York Times called Bloedel “one of this country’s most original and ambitious gardens.” We’re lucky enough to have it just a few short minutes from The Eagle Harbor Inn. 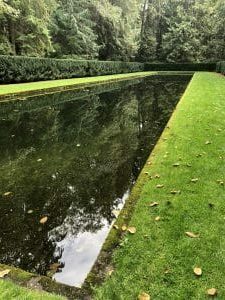 Once you’ve arrived at Bloedel Reserve, take the time to wander through as many of the trails and gardens as you can; an entire day can certainly be spent immersed in these tranquil grounds. In total, there are 12 different gardens, including a delightfully green moss garden and an award-winning Japanese garden. Another worthwhile stop on the property is the 1920’s-era home. As the seasons change, so too do the gardens. No two visits to this extraordinary place will be the same, but each be an absolute delight. Beyond Bloedel Reserve, there are many other tranquil and beautiful trails and beaches to explore on Bainbridge Island, and you’ll do so without the traditional crowds of summer. Fall truly is a magical season. Come experience it with us on Bainbridge Island this year. Book your room at our luxury hotel today.